DATE/TIME: Wednesday, January 16, 2019 / 9:29 a.m.
Deputies from the Yucaipa Police Department received a Children and Family Services (CFS) referral alleging Manuel Corona had molested a child under the age of 14. Deputies responded and corroborated information during the investigation. Manuel Corona was contacted and detained without incident. As the result of the investigation, Corona was subsequently arrested and booked at the Central Detention Center for PC 288(a) – Lewd and Lascivious Acts with a Child Under the Age of 14 and PC 3455 – Violation of Probation. He is being held without bail. Investigators are releasing the Corona’s photograph to the public in an attempt to identify additional victims or unreported incidents. 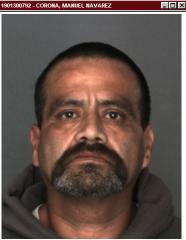 Anyone with additional information may contact the Yucaipa Police Department – Detective Division. If you choose to remain anonymous, call We Tip at 1-800-78-CRIME.